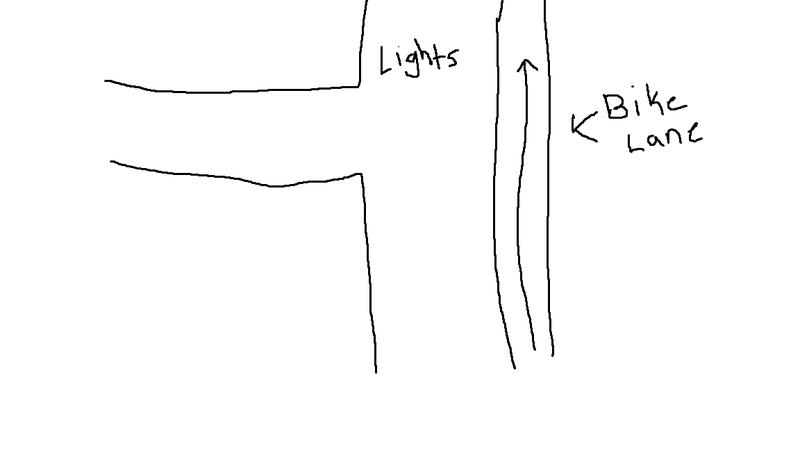 I was wondering if I was on a bike could I run a red light if it is impossible for me to get hit by a car? (Unless the car drives into the bike lane). I made a quick picture on paint to try and show what I mean. EDIT: I live in Washington and here is a picture from google maps, I never see anyone walking on the sidewalk on the side I'm going because it ends in a few meters so usually people jaywalk further back. I also forgot to mention that there is a huge hill after this (for me, I'm not the fittest person in the world) and that's really the only reason I'm asking this because the downhill I get will help me make it up the other hill easier, if it was flat I wouldn't be asking this. Better safe than sorry but because there is a huge hill and I'm not really the best climber I don't want to stop and lose all my momentum to make it up the hill. I also never see any other bikes on the street, just bikes in parks etc. NO. THE RED LIGHT MEANS STOP. AND IT MEANS EVERYBODY. The traffic lights are there for everybody's safety, not just yours. Pedestrians may be trying to cross, either because they have a green light or because there's nobody coming out of the side-road at the moment. Bicycles turning left from the side-road will be expecting the cycle lane to be clear for them to enter. They're already having to check behind them to make sure no car is either about to turn right across them, taking a wide line round the corner turning left or trying to overtake while turning left, where there isn't room. It's very hard to do that and simultaneously check for people in the cycle lane. I come across this exact situation at the very last junction on my commute into work: it is very dangerous. Also, at a more general level, a lot of motorists believe that cyclists are a bunch of scofflaws who don't deserve respect on the road because they don't obey the law. Motorists disrespecting cyclists is very dangerous for us, so please don't give them any excuse to do it. * Now that an image of the specific junction has been added, I agree with Argenti Aparatus's answer that the absence of a stop line in the cycle lane suggests that local law does say otherwise in this case, and cyclists may go through this red light. Most intersections are stop-on-red. The bike is a road vehicle with rights and responsibilities, and one of those is "not running over other road users" which includes crossing pedestrians. Be a good road user by Stopping on red and stopping on stop. I have a couple of intersections in my city where its clearly marked for the bike lane to go around the lights without stopping. The bike lane goes up to the footpath area behind all the lights. But these tend to be the exception. Do note the double painted stop line for the bikes which don't take the red-painted path. And the cyclist who is exiting the intersection, via the road not the bike path. At speed, the wiggle and change of level is unpleasant and staying on the level road is more comfortable. so I ride straight through on green. Answering after image of the intersection added. There is no white line across the bike path which implies bicycles are not required to stop BUT you should check your local traffic laws. However, if bicycles are not required to stop, you shouldn't ignore the light. Large vehicles with large turning circles may intrude into the bike path, or car drivers might go wide and do the same. At the very least you should treat a red light as a stop sign: stop, check for traffic and proceed if clear. Bear in mind the road entering from the left has a right hand curve making seeing approaching traffic difficult. 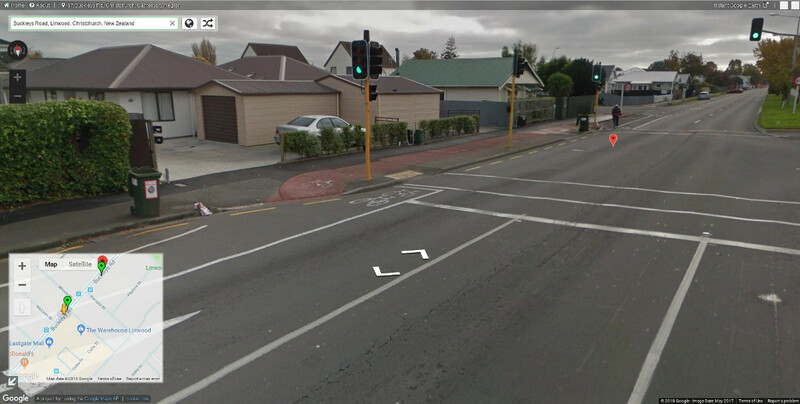 I face this sort of junction daily (it's a mirror image as wide drive/ride on the left). While there may be jurisdictions where this is legal, it's certainly not here. I'll assume you've checked for pedestrians crossing and there aren't any. It's certainly foolish. Vehicles can take interesting lines into their lane, especially bigger vehicles that have a hard time seeing and may swing into the bike lane. The two lane junction I pass through like this often has vans sticking into it on the turn, which they take wide before straightening out. This is made worse by the traffic in rush hour squeezing into space that's not theirs. Getting sideswiped is no fun or clipped by a wing mirror. Admittedly this is a rather narrow bike lane but it's perfectly usable when drivers settle into their own lane. The answer depends entirely on the local laws where you are riding. In most areas cyclist are expected to obey the same traffic laws as vehicles while on the road. Local laws may allow exemptions while in a dedicated bike lane. Since the laws can vary from city to city we have no way of determining if it legal where you are. Yes, but with a small caveat. In Washington, it appears to be legal to ride your bike on the sidewalk. 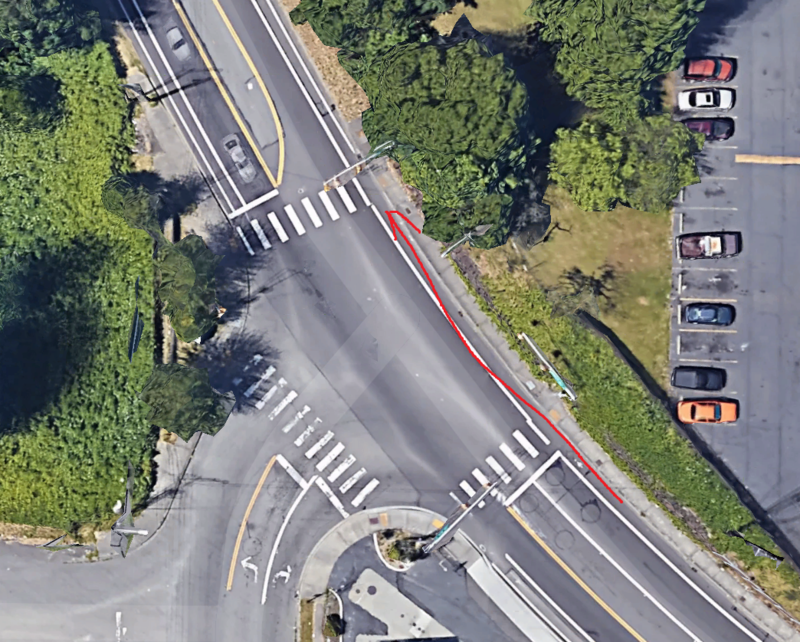 If you mount the sidewalk just before the intersection, ride through during the red, then dismount back into the road, you are not violating any laws. Just don't create a traffic hazard or pedestrian hazard while doing so. Additionally, follow all the usual safety tips when riding on a sidewalk. Should the laws be amended to allow cyclists to run red lights?